The laundry room can quickly become a mess. After all, it serves as the depository for dirty clothes in the home and must hold the many appliances, tools and supplies needed to get items clean and ready to wear. Use these laundry room ideas and tips for organizing your space and never trip over a pile of clothes again! Combination and stackable washers and dryers used to only be available in small sizes, making them suitable for singles in efficiency apartments, not for larger families with lots of laundry. Now, manufacturers make full-size washer/dryer combos and stackable units, allowing you to have the capacity you need and free up floor space. When laundry comes into the room, immediately sort it into whites, darks, and delicates. That way, when you have enough for a load, it’s already separated and ready to go. Those without proper storage tend to keep laundry tools and supplies on top of the appliances, which in the case of the dryer simply isn’t a good idea because of the heat it generates. 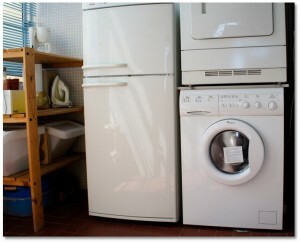 Clear the surfaces by hanging shelving above or adjacent to the washer and dryer. Instead of the standing drying racks that take up floor space, opt for the kind that hang on the wall and pull out accordion-style to create bars for wet clothes. When not in use, they simply fold back up against the wall. If you do not have the wall space, other options exist such as this hanger version with clips. It works well if the only clothes you air-dry are delicates. For those who save money on dry cleaning bills and instead iron at home, ironing organizers are available that feature hooks at the bottom on which to hang the board, with a shelf above for the iron itself and other supplies. If you have ever had an ironing board get bumped and fall away from the wall and against your head, you know this is a valuable tool. Some homes do not have a dedicated laundry room. The units are tucked in the corner of a room or take up the entirety of a closet. If this describes your setup, build a laundry butler you can store in a bedroom closet and roll to the area when you do laundry. This version features three baskets that slide in and out and allow you to separate dirty clothes into lights, darks and delicates. The tray on top will hold your laundry supplies. Clutterdiet.com created this video that lists the 12 elements of a well-organized laundry room. It includes many of the tips above as well as suggestions such as to keep a basket handy for socks that lose their match and a piggy bank in which to put loose change from pockets. In addition to organizing your laundry room and keeping it that way, also be sure to clean it regularly. Clear the lint trap after each load and schedule regular cleaning of your dryer hose and duct. Also wipe down the surfaces weekly. Lint, hair and dust accumulates quickly in the laundry room, and the last thing you want to do is place items on top of the dryer to fold only to have them come away in need of a run through the cycles again. Opt for a trashcan with a lid in the room to keep the lint and other debris inside. For your home cleaning needs, call the professionals at Molly Maid. Call(800) 654-9647 now to connect directly with your local Molly Maid. Each maid services team comprises insured, licensed and uniformed housekeepers who are regularly supervised. Click here to request service in your area.